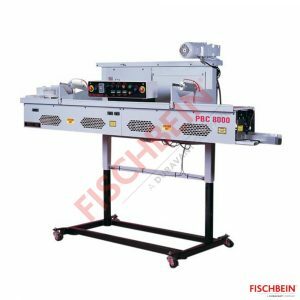 Fischbein’s PBC 8000 Pinch Bag Closer (PBC) is a heavy duty sealing equipment that folds and closes pre glued, multi-wall paper bags. It is specifically engineered for high volume bagging operations that use automated twin bagging systems. The Fischbein PBC-8000 can operate at speeds up to 45,7m/min. The Fischbein PBC-8000 closing device for "Pinch" bags is a top of the range system that closes a large range of pre-glued paper bags of the multi-layers “pinch” type rapidly and efficiently with a great reliability.